Abstract: In this month’s column, Kerry Hennigan discusses the importance of remembering to listen to Michael Jackson’s music and watch his videos purely as a fan rather than as a researcher or academic. She suggests that, with no specific agenda in mind, we are better able to enjoy the work and absorb the messages Michael wished to convey with his art. This can lead to even greater appreciation and a state called “blissing the mind” – a term Kerry employs to describe the feeling that comes from surrendering to the music and enjoying it without prescribed expectations. Hennigan, Kerry. 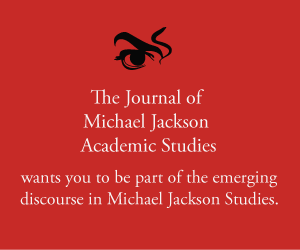 “MJ Studies Today XXXV (14-11-2018).” The Journal of Michael Jackson Academic Studies 6, no. 2 (2018). http://michaeljacksonstudies.org/mj-studies-today-xxxv/. As a Michael Jackson blogger and a contributor to this monthly column, I often listen to Michael’s music or watch his short films and concert videos with a specific research goal in mind. This work – which is, after all, my hobby and my passion – brings new understanding and enhanced appreciation of the art of the man known as the King of Pop. However, I believe it is important for those of us committed to studying Michael and fostering MJ studies, to step back from that role occasionally just to listen to the music as a pure fan. Enjoying the music of Michael Jackson minus any prescribed agenda can result in an experience I call “blissing the mind”. I was recently reminded of this one day at work when I had been streaming a history audio lecture on YouTube. At its conclusion, I let the auto play function continue to roll through items saved in my list of favorites, many (most) of which feature Michael Jackson. Hearing these tracks without having orchestrated the order of their playing resulted in that blissing of the mind effect: being a sensation that comes when we surrender control of things and let the magic happen. There is also the bittersweet elixir of emotions that run the gamut from melancholy (Stranger in Moscow) to joy (This Is It) and hope (One More Chance) with a desperate plea to “change the world” as a finale (Cry). We know from studying his creative processes in and out of the recording studio that Michael Jackson did not stand static or emotionally guarded before the microphone. He put everything into it that the song or performance demanded, and he kept recording and rehearsing until it was as perfect as it could possibly be, until the song said what Michael wanted it to say, the way he felt it needed to be said. He cared that much about his art. Yes, he wanted to be the best at what he did; but he also wanted to get his message across. These expectations made him a perfectionist – one who inspired and created opportunities for many others in his industry, and even some of us working in entirely different fields. Stepping outside of our academic agendas and letting his music play through our headphones makes it seem very personal indeed. If we allow the time and space in our busy lives, the music can truly touch us, just as Michael intended.